There isn't a bad song on this entire, three-disc, 50-song collection, but questions arise about the necessity of this release, simply because this is neither the first boxset nor the first hits compilation for the prolific band. Simple Minds are best known for their huge hit “Don't You (Forget About Me)” from The Breakfast Club's soundtrack, and with good reason. It's a great song from a classic film. Of course, this was far from their “debut single” (the band had been around for eight years prior to that 1985 release) and their strong following from the late 1970s forward showed a bit or resentment toward the band's Top 40 success, as opposed to their “post punk” origins. The band's 2013 retrospective boxset Celebrate – The Greatest Hits + features 50 songs over the band's long career and serves as just about the best possible remedy for such fan angst. At least, it's the most encapsulated and detailed collection of their many musical branches and changes over the years before and after their biggest (but far from only) big hit. Divided into three CDs, the retrospective contains 16 songs from the band's 1979-1984 era on the first disc, 16 from the 1985-1991 era on the second disc, and 16 (plus two new, original tracks) from the 1995-2013 era on the third disc. From the opening track (the title song from their 1979 debut Life in a Day), it's easy to see why Simple Minds have been considered prime examples and even innovators of the “New Wave” movement. With experimental sounds, driving rhythms (exemplified by songs like “Changeling” and “I Travel”) and even occasionally heavy guitars, all surrounding the direct and even electronically droning voice of Jim Kerr, Simple Minds may have sounded a lot like other bands of the era, but that is partially because they were helping lay down the groundwork for this burgeoning electronic movement. Throughout the first disc, Kerr's voice grows and expands from a basic low “progressive” tenor to a more dynamic and expansive range. This same evolution impacted his keyboard playing, which reached new heights of experimentation during this period. The instrumental “Theme for Great Cities” showcases his haunting key-style as it carries the listener through an electronic themed soundscape with no lyrics to ground it. This evolution sets the stage for the band's second era (represented by the second disc) that logically kicks off with “Don't You (Forget About Me)”. The first half of the second disc comprises a series of recognizable hits from “Alive and Kicking” and “All The Things She Said” to “Promised You a Miracle”. “Sanctify Yourself” marks a certain INXS style to their sound, which is interesting because this era also marked Simple Minds' delving into more Christian and politically themed lyrics, drawing inevitable comparisons to U2. “Ghost Dancing” and “Belfast Child” (the latter of which features a series of beautiful guitar leads and solos) set the stage for protest songs like “Mandela Day” and Simple Minds' remake of Peter Gabriel's “Biko”. The band continues with more of a rock and roll bend for the rest of the disc, showcasing some very fine guitar work by Charlie Burchill on “See the Lights”, the band's last Top 40 single. Kerr's voice is almost unrecognizable as the same one that opened the 1979-1984 era. As more gospel and choral influences took hold of the band, Kerr's voice handled every step. The 1995-2013 era, though not a commercial highlight for the band, also avoids any sort of musical stagnation as the band continues to evolve their rock and roll sound. Songs like 2002's “Cry” and 2005's “Home” both show the band's continuing capabilities. Even the two new tracks, “Blood Diamonds” and “Broken Glass Park” sound like what they are, new songs from the evolved band that gave us “Don't You (Forget About Me)” and other cool 1980s songs, neither trapped in that bygone decade nor forgetting what made them such successes to begin with. Celebrate proves to be an excellent retrospective of the best of the band and a wonderful primer for new listeners. That said, questions arise about the necessity of this release, simply because this is neither the first boxset nor the first hits compilation for the prolific band. 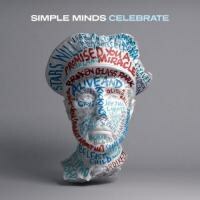 The vast majority of Celebrate can be found on 2001's The Best of Simple Minds, with even more available on 2007's Sunday Express Live and 2004's five disc Silver Box. Further blunting the argument for necessity is that there are actually too many songs to fit on three discs. To facilitate their inclusion, over half of the songs are edited to slightly shorter versions. While this isn't the end of the world and there isn't an actual bad song on any of the discs, Simple Minds fans will find little in the new compilation that they don't already have, so they might as well download the few tracks they lack and create their own Deluxe Celebration.